A variety of cellular processes occurring in the central nervous system are involved in the generation and accumulation of extracellular hydrogen peroxide (H2O2). Generation of H2O2 through disturbances in mitochondrial activity as well as the metabolically driven synthesis and breakdown of dopamine (DA) have all been implicated in oxidative stress. 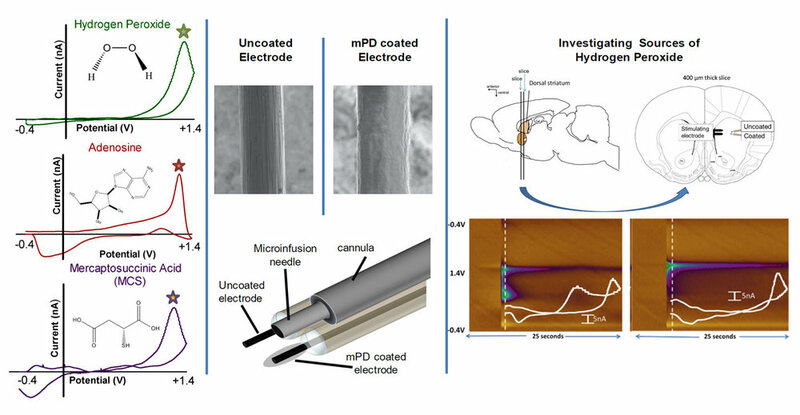 Through utilization of an m-phenylenediamine (mPD) membrane applied to one carbon fiber microelectrode in a dual microelectrode device, we can directly distinguish H2O2 from other interfering analytes that oxidize at similar potentials. We utilize local microinfusions of pharmacological agents to investigate the cellular processes contributing to the generation and accumulation of extracellular H2O2 in the dorsal striatum.